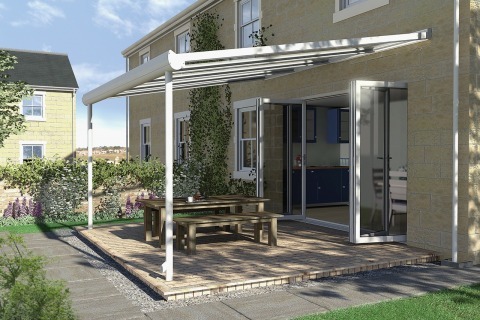 Contemporary in design and functional in use, Pergola is the latest product in our outdoor living range, helping you to enjoy the outdoors. It’s available in 9 sizes and in two distinctive colours: white or textured grey. It can be used to create a stunning, contemporary patio area, allowing you to enjoy the outdoor whilst protecting you from the elements. 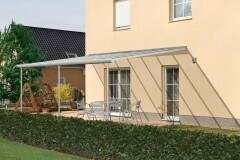 The Pergola can also be used as a carport and its innovative curved beam functions as an ingenious guttering system, whilst delivering beautiful aesthetics in a structurally superior design. This fusion of engineering excellence with contemporary design is reinforced by the aluminium posts being part of the immensely robust structure, whilst also fulfilling the function of a rainwater downpipe to drain water away from the building. 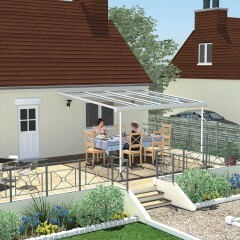 The Pergola is glazed with 6mm glass which delivers the outdoor feel of the classic pergola style, whilst offering protection from the rain. Click on any of the thumbnails below to get further inspiration for your Pergola. Think carefully about your external space and the overall colour and purpose ask one of our local Register Installers for additional expert advice. Once conservatories were just white, but we can now offer our Garden Loggias in a wide range of lifelike woodgrains such as Irish Oak and beautiful colours such as Chartwell Green. We’ve been manufacturing conservatories with colour foils for over 10 years now and in recent years have added a number of options with all accessories produced in a perfect and matching finish, also available for our Outdoor Living options. Residence 9 is our premium window and door system that offers period detailing, exclusive foil finishes and a striking flush finish. At present we are the only company in the UK capable of manufacturing a complete Residence 9 conservatory. If you don’t want one of our existing foiled finishes then we can offer a bespoke colour matching service and create something truly individual using our in-house paint facility, with proven technology from the automotive industries. Contact us today to speak to a member of our team who can provide you with details of your local Registered Installer or we can post you a copy of our new brochure.